The ancient legacy of India for which it is known worldwide is decently saved in its temples, which are likewise a famous travel fascination for travelers. Among the lot, the renowned ones in South India are the best of all. Reflecting the structural marvels of Pallavas, Cholas, Chalukyas, Nayaks, Kakatiyas and Vijayanagar rulers, celebrated the temples of South India are a treat. Located in Madurai, Tamil Nadu, Meenakshi Temple is a standout amongst the most visited sanctuaries in South India. Assembled amid the rule of Pandyan King Kulasekara, the temple is a splendid structure and a great magnum opus made by talented artisans. There are very nearly 985 delightfully molded columns supporting this sacred sanctuary which is devoted to Lord Shiva. There are additionally two sanctums of Sundareshvara and Meenakshi here. A trip to Madurai is a must if you want to experience the epitome of South Indian Temple architecture. Placed in the city of Thiruchirapalli or Trichy, Tamilnadu, Rock Fort Temple is one splendid bit of structural planning of Pallavas rulers. At first, manufactured as a little place of worship by them, this acclaimed temples of South Indian was later revamped by the Nayakas. The deity who is worshiped here is Kangaala Moorthy, one of the 64 avatars of Lord Shiva. Badami Cave Temples, Karnataka were constructed by Pulakesin I in the sixth century A.D. There are four cavern temples of South India that carry the inherent Chalukyan structural style. Known as the Tirupati Balaji Temple, this temple is committed to Sri Venkateswara (Lord Vishnu). Spotted in the Tirupati in Andhra Pradesh, the sacred temple is known to be the wealthiest place of worship in the world. 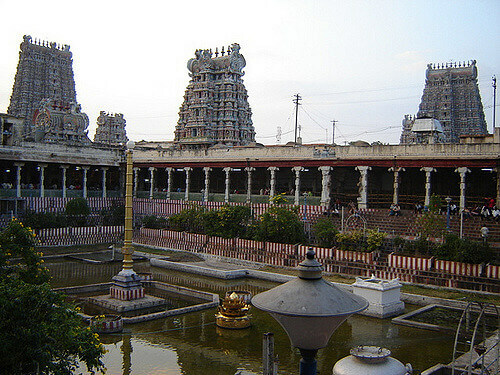 Furthermore, it is counted amongst the most acclaimed South Indian temple. Devotees from India, as well as from different parts of the world come here to seek the favors of the god as it is accepted that one can achieve Moksha in Kaliyuga by adoring Sri Venkateswara. Travel to Tirupati today to experience its religious charms. Your trip to South India is incomplete without visiting one of these beautiful temples of South India. Plan your trip now!